Thu., July 26, 2018, 6:08 p.m.
PAU, France – A French team finally won a stage in this year’s Tour de France when Arnaud Demare of Groupama-FDJ comfortably claimed a sprint victory in the 18th stage on Thursday. 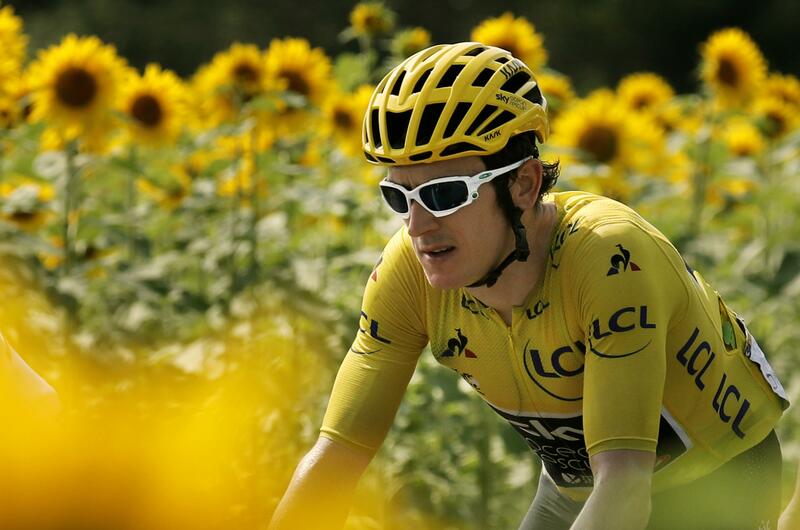 After two grueling days in the Pyrenees, Geraint Thomas was able to enjoy his seventh day in the yellow jersey during the less challenging 171-kilometer (106-mile) leg from Trie-Sur-Baise to Pau that featured only two minor climbs and a flat finish. Thomas remained 1 minute, 59 seconds ahead of Tom Dumoulin with the Welshman’s Sky teammate and four-time champion Chris Froome third, 2:31 behind. Only two challenging stages remain – a lengthy leg through the Pyrenees on Friday including three major climbs, then a technical individual time trial on Saturday – before the mostly ceremonial finish on the Champs-Elysees in Paris on Sunday. Fernando Gaviria of Colombia and Dylan Groenewegen – who had each won two stages in this year’s race – called it quits during Stage 12 to Alpe d’Huez. That came a day after Mark Cavendish and Marcel Kittel, who have a combined 44 Tour stage wins between them, failed to make the time cut on another mountain leg. Demare finished Wednesday’s stage second to last but managed to avoid the time cut. “I want to thank you for this,” Demare said. “I thought a lot about (Greipel) today. It’s not in my mindset or my philosophy to (cheat). I worked hard in the mountains before the Tour and, as a result, I made it through mountain stages when most of the sprinters did not. “I’m still here. I did not fight for nothing. It was super important. I’m not the best in the mountains but I did not give up and today it paid off,” Demare added. It was Demare’s second career victory in the Tour, having won Stage 4 last year. The previous French sprinter to win two Tour sprints was Jean-Patrick Nazon in 2003 and 2004. It was also the first time French riders finished 1-2 in a Tour sprint since 1978, when Jacques Esclassan finished ahead of Yvon Bertin in Saint-Amand-les-Eaux. On a warm day in southern France, the stage took riders through the vineyards of Madiran to the city of Pau, the birthplace of 16th-century King Henri IV. It was the 70th time that the Tour passed through Pau, which first hosted the race in 1930. Published: July 26, 2018, 6:08 p.m.